The final week at McQuarrie Middle School was going to be anything but normal. We all knew that for sure. We had one last mystery to solve. The mystery that has plagued us since the very end of seventh grade. What had happened at our field trip to Washington, D.C. I never remembered putting anything like that in my locker…weird. Could somebody else have done it? It would have been extremely difficult for them to do that if so. Either way, I picked it up, and began reading the page. Emperor Pickletine was defeated. Harvey’s plans were foiled. The secret of Origami Yoda was revealed. It was finally time for this insane field trip to end. I walked over to the school bus. I noticed the faint shape of a student, standing on the opposite side of the bus, glancing at me through the window. I walked over to the person, curious. I peeked my head around the bus, and called to the person. “Hey! Dude! We’re about to leave…..um…….” My voice caught. The student was wearing a hoodie. “Tommy Lomax,” she said. Her voice was familiar. The student flipped off the hood. I waved. I was about to come over and try and figure everything out, when I saw, out of the pocket of the hoodie, a handful of skittles. One skittle. Two. Three. Chewed and swallowed in a matter of seconds. I was too shocked to move. Suddenly, everything around me began changing. I quickly jotted down everything that had happened—what you’re reading now—in a notebook. If this is me, Tommy, then you were meant to read this. You’ve got to save McQuarrie Middle School. You need to defeat our new enemies. You have to stop Lisa. I stumbled backwards in shock. The brain-farts. The other origami Emperor. My fogginess about the field trip. It was all because of Lisa. I accidentally tripped over my locker stuff, which made me fall over to the ground. Some kids near me, like Kellen and Jacob, walked over to help. “Hey, man, you alright?” Kellen asked. The five of us –Tommy, Harvey, Mike, Lisa, and I–all met at the library together. Once he explained how he came across this note, he was about to read it to us, but Lisa walked over to him and whispered in his ear. I gasped. In one moment, both Tommy and Lisa had disappeared! Just like Vernon and that girl did at the musical! I hurried over to Tommy’s seat, and tried to find any evidence to help us find out what happened. (Of course, I was the only one looking for evidence, so everybody probably thought I’d gone insane or something). But then…get this…I found something. I stared at the colorful candies in my palm. A little while back, Harvey had found out that there were recalled Skittle boxes on sale at a local Qwikpick. The problem was, these Skittles were made in a candy factory that was next-door to a wishing well manufacturer. Some sort of accident happened, and bada-boom: You wish for something, pop a Skittle in your mouth, and your wish comes true. The more Skittles you eat, the bigger the wish. At least, that’s my best guess. I closed my hand over the Skittles a couple times, getting the colorful stuff all over me. But I didn’t care. It was time for me to make my wish and help my friends. “I wish that…” I was interrupted by Harvey, who was trying to take the Skittles from me. “No way!” I said. I felt like a little kid, fighting over candy. I stopped myself, but it was too late. The Skittles fell into my mouth. I couldn’t help but swallow them. Harvey was gone, and I’d wasted my only chance to help out my friends. Once again, I braced myself for something weird. But when I opened my eyes, we weren’t dematerialized or anything. We were just in a garage, by the looks of it. Spare tires, old boxes, and mountain bikes littered the ground. I stood up, and faced Lisa. “How do you…? We never showed Lisa our case files. She shouldn’t know about anything we wrote. (Not that we tried to be offensive or anything; we were just being honest). “Well, then…What is it?” My heart was pounding like crazy. If they really did know Yoda’s secret…. Kellen got Mr. Howell to lend him the loudspeaker, and he called together the entirety of the former Origami Rebel Alliance. When we made our way to Mr. Howell’s office, Kellen was waiting there for us. Everybody was there. I started getting nervous. As Kellen kept giving out tasks, more and more students started exiting the room, leaving only one person besides me who wasn’t assigned to anything yet. I gulped. Jacob and I had a weird relationship. He was always really sweet to me, but sometimes he was acting TOO sweet. He’d write me a sweet card filled with poetry, or get me flowers for the talent show, or other yucky-blucky romance stuff that would actually be sweet if I weren’t already in a relationship with Tommy. (Well, a relationship of sorts… He won’t let anybody – Tater Tot, Chippy, Jacob – get in the way of anything we’re doing together. Anytime one of those guys even talk to me, Tommy starts freaking out. It’s really getting annoying. But here we were, me and Jacob, going out of the school to save him. Go figure. Jacob glanced over at me. He looked pretty nervous. Maybe he felt the same way. Both of us were awkwardly being shy and avoiding each other, until Kellen told us where to start our search for Tommy. A little while later, (and after an embarrassing attempt to convince my mother that I wasn’t “cheating” on Tommy), we made our way to the Qwikpick. The good news: they were selling pork rinds again. Good for Dwight and Quavondo. The bad news: no skittles. I walked over to where the candy should be, and all that was left was a sign that said, Warning: Do not eat! These Skittles are being recalled by the Lucas County Board of Sanitation, for reasons concerning their factory’s neighboring building, which manufactures wishing wells. “Sara, you’re a genius.” Jacob said quietly. We both practiced our evil laughs together in the car, until my mom pulled up at the skittles factory. We both got out, laughing for real. We stopped. Everything was dark and gloomy. Nothing like we’d expected a skittles factory to be like. But the neighboring building did have a ‘25% off your next wishing well!’ sign. We walked up to the doors of the skittles factory, and opened the doors. A big, gruff, tall man was standing there. The man interrupted me with a shriek like a little girl. He ran into the factory, horrified. As we got closer to the factory, we noticed that it was actually very beat down and old. That sign I had seen a little bit ago actually looked really old up close. I tried touching it, and some of it peeled away in my hand. “Sara,” Jacob said. I walked over to him. He was peeking through a window. I glanced in. There were no lights inside, and the inside space was void of any wishing wells or employees. I wondered how Jacob acted around other people. From the case files I’ve read – Emperor Papertine, Origami Jedi Council, etc. – Jacob was much less open about his emotions. He had a much darker character around them. So, why was he always so incredibly sweet around me? “Sara!” He avoided my question, running over to a closed-off area outside of the factory. It had yellow police tape all around it. A wishing well. “I…I think we found it,” Jacob held up a handful of skittles that had just sprouted out from the well. This thing was filled with skittles instead of water! “Quick! Wish for us to find Tommy!” I cried. I ran towards him, but it was too late. He had already swallowed the skittles. Mike’s Comment: Um, this is great writing Sara, but who’s Jacob? Quavondo’s Comment: Yeah…I thought we sent James Suervo with you, or somebody. Lance’s Comment (via text message to Sara): I think you’d better come back to the school. You might wanna see the nurse about that… I don’t remember any “Jacob Minch” ever being a student here. “Mr. Howell?” I said. He was sitting in his chair, messing around with Jabba the Puppet. He didn’t have anything left to do, this past week. The paperwork was filled out, and the students all took the matter of the school’s money very seriously. “What is it, Kellen?” Howell asked. “I was helping to clean up after the musical a few weeks ago. I found a couple skittles. I thought maybe that was what the bounty hunter girl used to make herself disappear. But I wanted to keep the skittles here, just in case you kids needed them.” He reached into his desk, and pulled out a zip-lock baggie with a few skittles in it. He handed it to me. I saluted him, and he saluted back. Kinda awkward, but hey, at least Mr. Howell and I were finally finished being sworn enemies. He’s a good man, and – don’t put this in the case file, Mike – I really respect him a lot more now. I walked over to the school nurse’s office. Sara was in there now, but she seemed perfectly fine. The nurse said it was strictly protocol, but Sara wouldn’t have it. Finally, she burst out of the room, knocking me over. “Who?” I looked at her blankly. I feel bad for her, but I really think she must’ve accidentally inhaled a magic skittle or something. “Eaten the Wishing Skittles, he had…” Origami Yoda said, ominously. Dwight came over to us, looking really bad. Ever since he’d heard the news about McQuarrie closing, he’d been acting completely down in the dumps. If his mom sent him to another school that thought he was “special,” then Dwight might seriously lose it. I stopped. That’s what Tommy got so freaked out about. I thought harder, trying to remember. My brain felt like it does after I look at an optical illusion or I watch a 3-D movie for too long. All weird and fuzzy. “There was a…vote…a class presidential vote. And…a shredder. A sparkler… There is another school… and…. The Emperor! THE EMPEROR!! !” I said. Finally, it all came back to me. Jacob, D.C., everything. Emperor Pickletine and Emperor Papertine. The two puppets jogged my memory. “Not there are the skittles,” Yoda said. I checked my pocket. They were gone. “What?” I cried, looking all around me for them. I pulled out Luke SkyFolder from my pocket. I felt more than ready to fight back against Jacob, but I was worried about what Origami Yoda would say next. Dwight began walking away mid-conversation. Origami Yoda had turned away, too. I guess I was on my own, so I called up Noah and told him about the situation with Jacob. “Sure man.” As I hung up the phone, I heard Howell talking over the loudspeaker. I noticed Ms. Rabbski was taking down our “McQuarrie Students are the best in the Galaxy,” and was replacing it with a new banner. The new banner fluttered open. It said, “YUB NUB!” and it had a bunch of Remi’s origami Ewoks taped to it. It was my greatest dream come true. First the food. Rocky Road ice cream—my favorite—was being served alongside REAL pizza, and sticky notes were on both the ice cream containers and pizza boxes, which said, “Compliments of Kellen.” Rhondella and Remi read the sticky note simultaneously, and they both literally tackled me with hugs. Then Remi started pulling Rhondella’s hair. Two girls were actually fighting over me!! Then, the Yub Nub song started playing over the loudspeaker. And best of all, Rabbski told us that since McQuarrie’s building is going to be remodeled for some new school, they’re going to re-paint all the walls, WHICH MEANS…. This would’ve been the best day ever for me. I could doodle all over the school, everybody loved me and appreciated my artistry…. But I couldn’t stay any longer. Tommy needed me. I went to Dom and Billy’s Pizza Parlor, and sat down across from Noah. He looked different than usual. Older. His dark hair was cut unusually short, and though I couldn’t place it at first, I noticed that his eyes looked slightly sadder. It threw me off a little bit, so Noah decided to start talking first. Mike’s Comment: BEST. DAY. EVER!!! Lance’s Comment: I’d hafta agree with Mike! Jack and I hung out in the library, and we got to yell and run around as much as we wanted!! Plus Jack GAVE me his Origami Boba Fett! (Which I realized, oh my goodness, it’s the one Tony made! The one I pretended to use against you guys? Now I still get my Boba puppet, without being a bad guy! Sweet! Quavondo’s Comment: THEY HAD PEPPERONI PIZZA!!!! REAL MEAT!!! Just as I was about to either accept or deny their offer, Lisa and Vernon’s skittles disappeared. Vernon began walking out of the garage area. I called to him. “Uh, because I love her?” Vernon rolled his eyes and walked away. I had. But the funny thing was, the choice wasn’t that hard at all. I mean, sure I’d LIKE to know what makes Origami Yoda tick, but without my friends at the school, none of this would’ve even happened. I got my mom to drive Kellen over with us to my house. We sat on my bed—the upper bunk of me and Jacob’s bunk-bed—and waited for Jacob to get home. Even though my family didn’t remember Jacob, I guess because I was the Chosen One, I DID remember. Or maybe that’s because Jacob hasn’t erased my memories of him yet. But why—?? Noah whispered something in Jacob’s ear. Jacob looked hurt and angry with whatever Noah said, so they started having some sort of whispering argument. Finally, Jacob nodded. He tried to pop a skittle in his mouth before continuing, but Noah swatted it out of his hand, and into my lap. I picked up the skittle. “Y’know what? If you won’t tell me why you’re acting like this… Then maybe you can show me.” I chewed down on the skittle, and thought a wish to myself. I wish I could know Jacob’s secrets. Suddenly, I felt like I was watching a movie. A really old black-and-white type movie, too. I saw glimpses of a much younger, elementary school-aged Jacob. “Mom, I don’t wanna go,” little Jacob said. “Promise me you’ll be here to pick me up?” Jacob said. Jacob ran into his classroom. His mother sighed. The next image I saw was from maybe a couple years after that. Jacob was sitting at a bench next to…oh my gosh. Dwight. The two of them were outside of a movie theater, which was showing Revenge of the Sith. They kept talking about the movie. I admit, I was bored. A couple seven year-old kids chatting about Star Wars can only be so entertaining. I glanced at the clock ahead of them. It was 2:30. Jacob and Dwight looked just as tired and bored as I was. Dwight nodded vaguely, in reply to my Palpatine idea. It took about 15 minutes, watching Jacob working in the hot summer sun, until he finally thought that he’d got it nailed. He held up his origami Darth Sidious for Dwight to see. Dwight nodded again, which must’ve meant he liked it. “There’s something. . . off about it, though,” Jacob said, studying it’s hood. The fold was somewhat lopsided, and it just didn’t look the way it did when Jacob reached middle school. “Here,” Dwight said, reaching over to Jacob, and taking the origami Emperor. “Hey! That’s mine!” Jacob said. “But you said that something wasn’t right,” Dwight said. He had made an origami General Grievous as well, which was on his other hand. Jacob must’ve been a very unstable little boy. With a sudden lunge, hd attempted to pull the paper—the Emperor and Grievous—from Dwight’s grip. “Give it back! It’s mine!” He said, fighting with Dwight, until they had both fallen off of the bench they were sitting on, and landed on the hard gravel ground. Dwight was fine, but Jacob was holding his head and screaming. Dwight, on the other hand, was sitting back up on the bench, ruining all Jacob’s hard work on his origami Emperor, and practically re-folding a new version instead. “Introducing. . . EMPEROR PAPERTINE!! !” Dwight said. You know how kids just kinda say stuff like “I hate you,” when they really don’t mean it? I’m pretty sure that was the case with Jacob, but Dwight didn’t realize that. He stopped instantly. His features were now blank, showing no emotion. He ran back to his mom, who was approaching them with posters, ready to hand them to Dwight. “Jacob! Is this true? !” Dwight’s mom said. Her voice sounded all angry-ish, like when she told off the school board last year. “Well, yes, but—” Jacob started, probably about to tell her about what Dwught had done, but Mrs. Tharp interrupted him. She took both posters, and lead Dwight to the car. She slammed the car door hard, and walked back over to me, her cheeks red with anger. “I’m calling your mom now,” Mrs. Tharp said to Jacob. “So don’t go anywhere while I call.” She dialed the number. The person on the other line was NOT Jacob’s mom. Whoever it was, he had a deep voice, and sounded sad. She faced Jacob. His innocent features looked upset from hitting his head, but he was still a good kid. He was still Jacob. Jacob’s eyes narrowed. He sat down on the bench next to her. She continued speaking, and Jacob’s horrified scream carried me into the next scene. It was more of a montage, with Jacob being at all sorts of different houses with different people, making big fussy messes everywhere and yelling and throwing temper tantrums. I felt bad for him. The next scene was really weird, because it was obviously at Jacob’s house—the one I was in—but it was painted in very dull colors. Gray adornments and baize flooring didn’t help either. A slightly younger Mr. and Mrs. Minch—who I’d seen a few times before, from when they’d pick up Noah from my house—stood with a younger Adam Minch, Jacob and Noah’s other brother. There was a knocking on the door, and Adam bolted over to the door. “He’s here! He’s here!” Adam said, leaping joyfully over to the door. He opened it up wide, and a big old lady was standing there with some papers in hand, with a 9 year-old Jacob cowering behind her. Jacob’s eyes lit up. “Like it?? I LOVE it!! !” He ran upstairs, to play with Adam. They were happy and laughing together. Finally, the vision-thingies stopped. I was back in Jacob and Noah’s room. Jacob’s expression was blank. “It looked like you had a concussion or something,” I said. “I’m not from America,” Jacob said. “I’m not legally an official American citizen yet, either. My parents started off as immigrants. When they came here, they had no idea about needing passports or filling out paperwork or anything like that. By the time they found out, I was born, and they kept their heritage a secret, because they were afraid we could be kicked out of the state. It’s all crazy red-tape stuff anyway, but the general gist is, I’m not legally allowed in any middle schools right now. I tried to keep it a secret from McQuarrie, but the Principal found out, and showed me grace. I got to stay at McQuarrie. Of course, then I found out that Dwight was going there….” He trailed off. “But you guys are friends again, now, so it’s all cool, right?” I said. Jacob nodded, and laughed. “What am I doing? I love it here.” He handed me all the skittles he had—which were in a big paper bag—and took one last handful of skittles from the bunch. “Here goes nothing,” Jacob said. He chomped on the skittles. Nothing changed, from what I could tell. Noah stayed behind, and sat down with Jacob. With McQuarrie closing down, I could only guess what that homework was. Jacob was finally going to tell the truth. But I had a good feeling about it. I wasn’t going to put Jacob’s secrets in the case file, so I just ended up putting that in my own personal secret case file. If I knew one thing for sure, it was that Jacob Minch was going to be just fine. A couple minutes after Kellen left, Jacob finished writing his paper for Ms. Bauer. She used to be a foster care worker before joining in the school, and I guess Jacob knew her from a few years ago. I hopped on my bike, and made my way to the theater in about five minutes. Francesca walked in a few minutes later. We had a great time watching Parasite Within III (which was only PG-13 and was just as cheesy as the first one), and Frankie gave me a hug before getting into her mom’s car. By the time I had pedaled home, it was dark out. I walked into my room. The light wasn’t on, so I assumed Jacob wasn’t home yet, but when I turned on the light, there was Vernon. “Where are the skittles?” he said. He fumed out of my room, and rode away on his bike. Vernon walked into the garage, empty-handed. No skittles. And finally, Mike ran up to a girl who was standing there. “Why don’t I remember…I should remember…” Mike struggled. He looked at Vanessa and Hannah as well, and watched the three girls all standing side-by-side. He smiled. While Mike was busy trying to figure out which girl to ask out, everybody else was standing behind Dwight, who held up Origami Yoda. Lisa cowered at the sight of all her friends and teachers staring at her. Kellen tossed her a wishing skittle. Lisa just stared and gaped for two minutes, and then she held up the wishing skittle, ready to pop it into her mouth. “I’m so sorry, guys,” she said. She ate a skittle, and everybody vanished, except for me, Dwight, and her. Even Vernon was gone. “Well, you did!” Lisa looked on the verge of tears. “Maybe I should just wish Origami Yoda out of existence. Without him, you guys would always be dorks like me! You’d always be losers like me! We’d all be one big, happy family of weirdos!” She tossed a skittle into the air, and was about to catch it in her mouth before I leapt for it, and caught it in my mouth. Lisa was running towards me. The first wish that came to my mind: I wish for a Lightsaber. Instead of a REAL Lightsaber, I got one of those plastic Hasbro ones. Lisa recoiled for a moment, but popped a skittle into her own mouth, and gained a crimson-red toy Lightsaber. She swung her blade at mine, and they clashed. I pushed her backwards, using her own force against her, and she tumbled into a couple bikes, dropping the skittles for a moment. I ran towards them, but Lisa got back up and ran at me, Lightsaber in hand. Dwight walked over to us, with Yoda on his finger. “Stop this, you must! Not worthy of you is this!” Lisa stopped, and glared at Dwight. “Dwight told me about the case files, he hurt my boyfriend, and he made the whole lot of McQuarrie Middle School act like spoiled brats! And I’m sick of it!” She reached into her pocket with the hand opposite her Lightsaber hand, and pulled out an origami puppet. It looked dark and fiery. “Do you know who I am?” the puppet said, in a growly voice. “Darth Bane. The ancient Sith Lord, you are,” Origami Yoda said. Yoda’s Bane. It was Lisa, all along. “Your case files never told you what happened to Yavada,” Lisa said. Lisa swung her Lightsaber, but I deflected it just before it hit Yoda. I turned around to grab the skittles, dropping my Lightsaber, but it was too late. Dwight was chewing down on them, completely unaware of their magical abilities. All those wishes…wasted. Dwight burped. I looked at him in horror. What had he done?? I ran at him, and snatched Yoda from him. I held Origami Yoda in my hands. This one piece of paper had caused so much grief for all of us. Sure he had good intentions, but maybe it was time for this whole charade to end. The prophecy said that a new beginning would arise if this happened. Real or not, Origami Yoda had to die. Dwight reached over to grab Yoda, but my grip was still pretty firm. He tugged, and we both heard a terrible ripping sound. For once, Origami Yoda didn’t seem so important to me. Dwight did, though. My friends did. I didn’t need to remember DC. I didn’t need McQuarrie. I didn’t even need Origami Yoda. I needed my friends. The next day, we all had a huge party for Lisa in the library. She was so thrilled, and nobody was being mean or judging her, and in fact, not even Harvey had anything nasty to say. Our last few days at McQuarrie Middle School were Total Rockets. We all folded a bunch of origami, made some incredible pretend case files—Origami Yoda Legends, we called them—and Kellen showed us a bunch of SuperDoodling tips! Origami Yoda wasn’t there. But Dwight was busy folding something else. I couldn’t figure out what it was, but since I heard he and I were both being transferred to the same school next semester, I guess I’d find out soon enough. And the quadruplets were coming with us too! Epic! Remi and Kellen made up, after Kellen remembered a little something that had happened between them in DC. Rhondella didn’t mind. She was pretty happy going on non-dates with Jacob Minch. It was the final day. Everyone was partying as usual, but they were taking a lot more time to talk with each other. Connor and Arnold came up to me. They were both going to the same school together, and they wanted to tell me about their monthly “Battles” meet at Winifred Park. I was the first to sign up. Jack went up to me and told me that his parents decided to enroll him in a private school for the year, and that this was probably goodbye. Everybody, including me, gave him a hug. Jack walked out the doors. Harvey and Isabel told me that they were both paired up and were gonna go to Roddenberry Middle School together. Harvey was a little worried about it—the name in particular—but Isabel converted an old Sockuss puppet into Mr. Spock puppet from Star Trek. “Everybody, meet the Spock Puppet!” she said. I wished them the best. Even Harvey, who apparently keeps talking to Isabel about memories of an evil pickle or something. Williams Middle School, prepare for some Origami Star Wars stookiness! “The new and improved SPL is strong with this one,” Eggbert said, as he ran over to Noah and his friends. I said goodbye to mostly everybody. Kellen was going to a special (and expensive) Walt Disney art school, which was perfect for him. Lance and Amy were just enrolled today into Tolkien Middle School—which is where Noah’s girlfriend Francesca goes! Mike, Quavondo, and Cassie were all going to Vanessa’s new school. Most of the other teachers and students had found different schools to go to, and most of them seemed happy with what they got. Even Lisa, who was now enrolled into Tippett Academy. Apparently, she genuinely liked being *special! * Good for her! Finally, Sara. She came up to me, and my heart was pounding like crazy. We both knew she was offered to go to Rhondella’s school, so I assumed this would be our goodbye. “Downey Middle School accepted Rhondella,” Sara said. “I’m going to Davison Middle School with you and Dwight!” Sara hugged me. I could barely contain myself. This was the greatest news ever! Everybody got exactly what they wanted! The perfect happy ending! Sara kneeled in close to me. We kissed. The toilets exploded. Kellen ran in-between us, holding a screwdriver. Water began flooding the hallways. “CAMPBELL!! !” Howell howled, also running in-between us. Just an average day at McQuarrie Middle School. I’m definitely going to make a trailer for this. You forgot Art2 and Han! DARN IT!!!!! I was going to make one!!!!! >;( I’m sfTANNER. You can still write it! The countdown has begun. The End is near, for all of us. Wow. I am literally in tears…this is it, eh? 4 days to our destruc- Nope, not even gonna say it. We all know what’s gonna happen. Haha I just finished writing it today. Now I just have to make some minor changes, and it should be ready! Also, wasn’t I supposed to be in it? This is SFHansel. I fixed it! Sorry bout that! Check out my own ending! JC, please move my ending to where it belongs, after Episode 20. All these years of superfolders writing stories and making millions of people laugh, cry, and smile have come to an end. But the stookiness does not have to. Origami Chewbacca was the beginning of a legendary website. Wait-you know what? Not just a website. A place where SFs can show off their writing skills and entertain us superfolders. JC was 12 when he started reading these books. I was only 10. My best friend and brother in force, SF Jedi Trevor, was 10 (I believe). We didn’t know what adventures was waiting for us. It has been the best years of my life, making new friends, writing stories, reading the books, folding Star Wars origami finger puppets, and asking MY Origami Yoda for advice IRL. I hope for everyone, every superfolder, every superfilmer, every superdoodler, every ultrafolder, and every superwriter to have a great future. The adventure does not have to end. The end this is? No, it is not. May the folds be with us. Always. Nicely said. And you are right, C.P.H. This isnt the end. 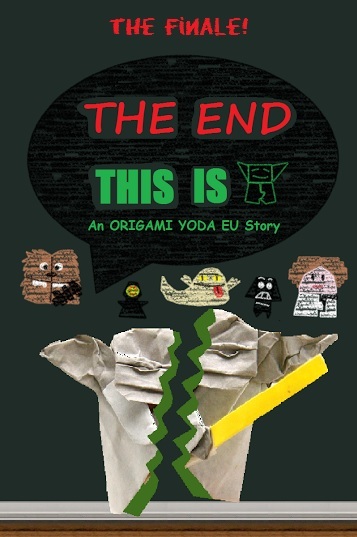 A New Beginning Will Arise, As Origami Yoda Dies! The person who wrote that really long comment was right! PS JC, did you get my idea about the Starigami Wars stories? Will I be in The Return of the Origami Jedi(I prefer “Foldi”) Student Council? The thing is, if I had let that comment be seen by people, that woulda spoiled the surprise about the EU/Legends! You were a few steps ahead of us! Yes! The Williams Gang will definitely return! Oh my gosh this story litterally made me cry, and I wish the Eu didn’t have to end. btw I started working on my own version of an alternate ending for pickletine but I don’t think it can even compare to this. good job everyone, who made EU stories, Origami and fun in the OY universe. wait… what country is Jacob from, though? We don’t actually know where Jacob’s parents came from. At least, not yet. Maybe Poland? JC, Excellent job once again!!!! oh…. okay!!! sweet!! well It’s pretty good and very well written! god job!! What other non-Star Wars are there going to be besides the ones listed in the ending? JC, what about MY story?!?!??? Oh awesome!!! My great grandparents came from Poland, so I always really enjoy Polish food and such. Wow !!! This was incredible ! Though I do wish I was in the story … Hey , maybe I can be in the ” The further adventures of Tommy and his friends ” ! Is there going to be a Disney origami story? Don’t forget, JC, attack on folding!!! Great idea Eggbert! Sounds good to me! That’s in the “and more” area! And Dwight should wield Qui-Gami Jinn. Cool idea! I just assumed he would use Yoda like always, but somebody could have Gui-Gami! Who are the Quadruplets? I forgot. They’re the characters in The Attack of Origami Shadow Squadron! When will Doctor Glue come out? Can I write anything? I’ve only done work on BTF, so I want to help out here too. This is the end. Unless your in Japan! October, probably. At least before Christmas. Thanks! Actually, if you’ve read the new post Tom just put up about the future of OY, then you have a pretty good idea of what to do! JC, what happened to Between the Folds? I can’t find it, and I don’t want to lose the Origami Teen Titans! The covers for these stories are super stooky. Congratulations to all of the superfolders/doodlers who made them! I would love to help make another episode, if you guys want me. it was a stooky story. JC ,I changed my mind. Instead of Ki-Foldi-Mundi, I want Qui-Gon Fortune! So, I guess continuity is no longer a problem? I love the expanded universe! And that had a happy ending! Wonderful! Everyone, we will return. We’re just doing other things at the moment. Nooooooooooooooooooooooooooooooooooooooooooooooooooooooooooooooo!!!! I know the series ended, but the EU CANNOT end. We will return. Have no fear. ‘Tis not the end, only the beginning … of the middle? As I said, we are currently busy. We have many things to do. But we will get back to you shortly. yes it is true. we have to continue. the force gives us that. this is a new dawn. a new era. I must help. how can i? how should I? how will I? wait, I had an idea. what if I made a website so there could be an eu of the eu? if I do, would anyone help? JC, did you get my email? Here’s a theory: It says in the story that Jacob and Noah have twin telepathy; something only twins have. But then it says that Jacob was first the son of Mrs. Cornelius, and it doesn’t mention Noah at all in the dream sequence. So maybe, Mrs. Cornelius isn’t even Jacob’s birth mom…Maybe, they were both separated at birth like Luke and Leia! I would make a trailer… if i knew how to…. Great story!! That was great I couldn’t get my face of my computer. Very interesting!!! cool / awesome/ ultra plastic dinosoars stooky X 10000000000! Multiple people on this site have a profile pic of the Cover Yoda. WHICH ONE IS WHICH??? Hello there. Another happy landing. Alright. Take one Guess. ONE GUESS AND YOU’LL KNOW IT’S RIGHT. On a side note, I got nostalgic rereading the Entire OY lore. I cried a lot and I was always like, NOOOOOOOOOOOOOOOOOOOOOOOOOOOOOOOOOOOOOOOOOOOOOOOOOOOOOOOOOOOOOOOOOOOOOOO! This can’t be the end! Ommigosh, Ommigosh, Ommigosh, Ommigosh, Mr. Noah! I have so many questions! Like, Is Noah Jekan based off of you? Well, Jacob quit being Papertine and became a good guy, so all is forgiven. Oh look, I see Noah’s old SF name: D.N. Cute.